Houghton Mifflin Harcourt, 9780151013777, 688pp. Carsten Jensen’s debut novel has taken the world by storm. Already hailed in Europe as an instant classic, We, the Drowned is the story of the port town of Marstal, whose inhabitants have sailed the world’s oceans aboard freight ships for centuries. Spanning over a hundred years, from the mid-nineteenth century to the end of the Second World War, and from the barren rocks of Newfoundland to the lush plantations of Samoa, from the roughest bars in Tasmania, to the frozen coasts of northern Russia, We, the Drowned spins a magnificent tale of love, war, and adventure, a tale of the men who go to sea and the women they leave behind. Ships are wrecked at sea and blown up during wars, they are places of terror and violence, yet they continue to lure each generation of Marstal men—fathers and sons—away. Strong, resilient, women raise families alone and sometimes take history into their own hands. There are cannibals here, shrunken heads, prophetic dreams, forbidden passions, cowards, heroes, devastating tragedies, and miraculous survivals—everything that a town like Marstal has actually experienced, and that makes We, the Drowned an unforgettable novel, destined to take its place among the greatest seafaring literature. As a boy in Marstal, Denmark, CARSTEN JENSEN sailed on his father’s boat, a 220-ton freighter named the Abelone. In 2000, he returned to Marstal to write We, the Drowned. He has also worked as a literary critic and a journalist, reporting from China, Cambodia, Latin America, the Pacific Islands, and Afghanistan. 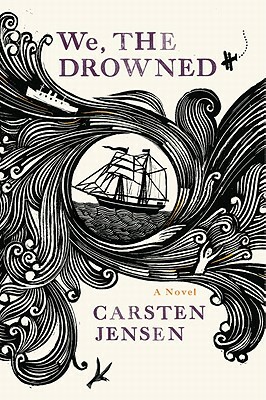 We, the Drowned won Denmark’s most important literary prize, while also being selected by readers of a major daily newspaper as the best Danish novel of the last twenty-five years. It was a bestseller throughout Scandinavia and in Germany, and has also been published in the United Kingdom, Spain, and France. "Powerful reading for a long winter's night... This gorgeous, unsparing novel ends during the last days of World War II with a captain struggling to bring his crew home after their ship is torpedoed. The sea is Marstal's life and Jensen's unstrained metaphor: luring the Marstallers away from home, offering uncertain passage and providing few harbors that are safe for long." "For all the brutality and suspense in the manner of Conrad, Melville, and Stevenson, Jensen's oceanic novel (already a bestseller overseas and gorgeously translated) is tenderly human . . . Jensen's resplendent saga, an epic voyage of the imagination, is mesmerizing in its unsparing drama, fascinating in its knowledge of the sea, wryly humorous, and profound in its embrace of compassion, reason, and justice."